Byron’s poem Darkness is an anomaly, completely different in form and subject matter than his other works, and it was inspired by a true event. The year 1816 became known as the Year without a Summer. Record cold temperatures and inexplicable darkness at noon threw the general populace into a panic. Speculation only fueled the hysteria seizing Europe. 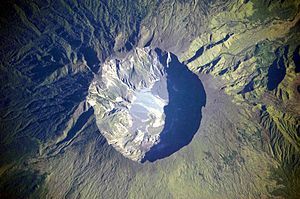 The underlying cause, unknown at the time, was a massive volcanic eruption in faraway Sumbawa Island, Indonesia. Mount Tambora, in the largest eruption in recorded history, spewed so much ash into the atmosphere that the average global temperature dropped by 3 degrees Celsius (5.4 degrees Fahrenheit!). After giving Darkness a read, you might want to try the mash-up at the very end of the post. It succeeds – well, almost. Unfortunately, the instrumental track, though pleasantly minimal at first, becomes too distracting for my taste (if only the guitar solo could be snipped out). The lengthiness of the poem doesn’t help either. The voice is that of “Tom O’Bedlam” of SpokenVerse, a man who dominates the YouTube poetry niche (he’s uploaded over a 1,000 videos). Ever since I started this blog, I’ve wondered who he is. Extinguished with a crash — and all was black. This entry was posted in Byron and tagged byron, Darkness, Mount Tambora, The Year without a Summer. Bookmark the permalink.